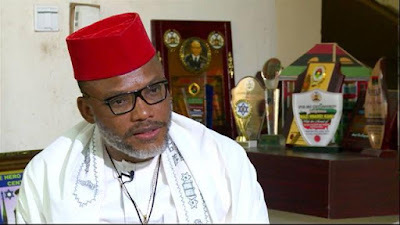 Stella Dimoko Korkus.com: Nnamdi Kanu Reacts To Court Order For His Arrest + Says There Is A Gang Up Against Him..
Nnamdi Kanu Reacts To Court Order For His Arrest + Says There Is A Gang Up Against Him..
A Federal High Court presided over by Justice Binta Nyako in Abuja, revoked Kanu’s bail on treason charges yesterday and also ordered his immediate arrest. “We are here to propagate this very gospel, the gospel truth and the gospel of redemption. People of iniquitous disposition will not understand what we are trying to do but the throne of light will”.Dailypost.. This man has shown time and again that he's not to be trusted... Someone who values his dog's life over and above the lives of those sympathetic to his idiosyncrasy. Sir there is no gang up, you are just no LOYAL period!!! Come down to Nigeria instead of noisemaking. Coward! Ogbeni make I hear word jare.. You had the chance to change our political views by playing politics, but you refused to be dynamic. Even Catalona struggle in Spain is done politically. The region have a separate government from Spain but still under Spain. I expected this guy to form a party or support a new party different from PDP and APC, in the Anambra election. But he botched it the moment he told channels tv correspondent that he won’t play politics. What he failed to realize is that l: if he had played politics by supporting someone in the Anambra election, the person would win by landslide, and that victory would have served as litmus test for IPOB popularity and possibly bring other south east states into IPOB fold and control. Now imagine the kinda power IPOB will have when all the governors, State House of Assembly members and federal house of assembly members are from the IPOB party. It will be easy to negotiate better deals for the SE and address all imbalances in the system when you wield such political control. In fact, the movement may later be contagious as youths in other parts of the country would want to form alliance and wrestle political control from these old politicians. With the mammoth crowd I see behind him in videos I’ve seen and support shown to him off and online, any candidate he supports would surely win. OPC and IPOB don’t have the same political agenda. So no comparison at all. If he had done what I said above, he won’t be a fugitive today. In fact, he would be sought after for political alliance before the general elections. This man's followers would have aligned with any candidate if he had endorsed one. His followers are the kind of guys who would come out to vote and aggressively protect it. He would have gotten Anambra and slowly but surely, become a huge force in the South East. Then negotiate for better attention to SE and restructuring. But no! He chose to take the crazy violent route, and urged his members to shun collection of PVCs and the election as well. Who recanted few days to the election? Him! I honestly see people who follow him sheepishly as fools. Ndi no lefelendum, no erection. The kingdom of God suffereth violence, and the violent take it by force. Arise, ye who refuse to be slaves! I want to know if his other friends are still in prison. No dear, they have all been released. Nnamdi kanu is a poor student of history. He probably thinks playing the martyr will automatically grant him his heart's desires. If I hear. So my question to him is, if the federal government chooses to declare Biafra a sovereign nation does he think he will automatically become the president of Biafra? I laugh in classical Japanese. Biafran is doable. I read someone's suggestion on youtube that they should do a petition to the ICJ for the recognition of the Independent Republic of Biafra and another petition signed by as many Igbos as possible to the National Assembly of Nigeria for the cessation of Biafra from Nigeria. But know this, their focus should only be on the 5 core igbo states. The rest of us southerners should agitate for restructuring along the lines of regionalism so we can manage our resources and develop at our own pace. Not Nigeria or Biafra milking us for their selfish reasons.